The Artisan™ AirGraver® has a patent pending improved collet design that helps the tool deliver impacts more efficiently. The tool is a work horse for jewelers. Speed range: 2400 at idle through 10,000 at 60 PSI when used with the included stainless piston. When used with a tungsten dead blow piston; 1500 at idle through 7,000 at 60 PSI. Three handpiece tubing attachment locations for customability and comfort. Non-slip rubber handle. Nose collets are S7 tool steel, hardened and tempered to 57 Rockwell. Cylindrical precision ground for a life time of service. Includes: Stainless body, two quick change collets, two high speed graver blanks (not sharpened), supple black rubber handle. The tool uses the same dead blow bore and pistons as the Classic AirGraver® handpiece for interchangeability and also includes a hex wrench, handpiece tubing and fitting, and owner’s manual. The Artisan™ handpiece does not have the patented stroke adjustment. Additional power if needed is attained by purchasing a tungsten dead blow piston. 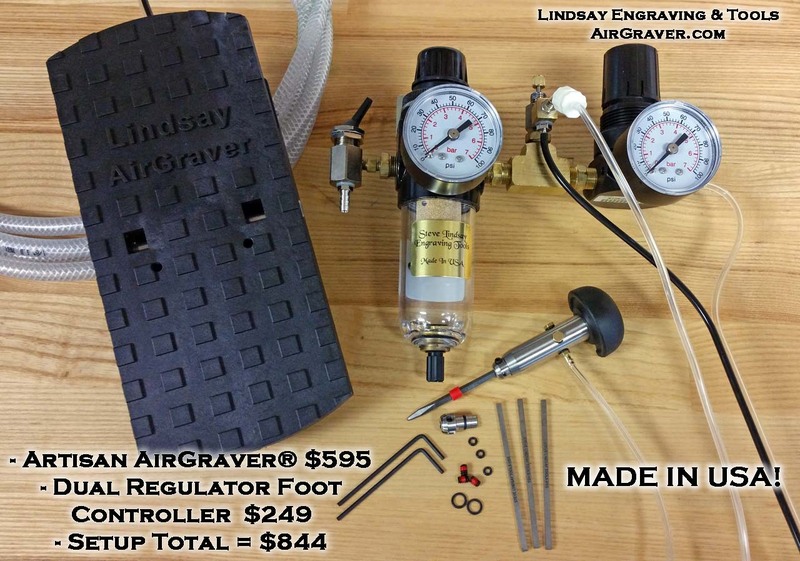 Click for More information about Lindsay AirGravers. Custom Amboyna Burl Handle for foot control AirGraver®. 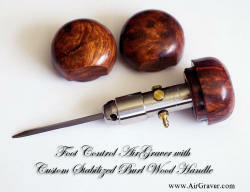 These burl handles will fit on foot controled Classics, Aritisans and NitroG90s. The Artisan™ hand piece together with foot control, idle adjust regulators is $844. This is the least expensive AirGraver® , together with a tungsten piston it is more versatile in power and speed than any competitor's top-end product. Top end power with the stainless piston is reached around 60psi where as the tungsten piston can be taken up to 80psi. The tungsten will really will kick-in up in that psi. If desiring to keep the overall price down of a system an air compressor can be expensive. However, because the AirGraver®s do not require very much air volume, the smaller inexpensive compressors work fine. Ace hardware and Wal-Mart carry a $59 compressor as well as a $99 one. They aren't as quiet as the Silentaire compressor but other than the noise they do fine. One way around the noise problem is to place the compressor in another room or in your garage and run an air line through the wall. Below is a chart. It shows the various impact speeds at different stroke adjustments of the Classic handpiece. The Artisan™ doesn't have this stroke adjustment but is fixed at the mid stroke length. Follow the "Medium Stroke" speeds on the chart to see the speed ranges for the Artisan™. The tungsten piston also works in the Artisan™ and there is a column for that. Follow the medium stroke column there too. For both the Artisan™ and the Classic the PSI ranges are adjusted with the foot control or the PalmControl® handle. 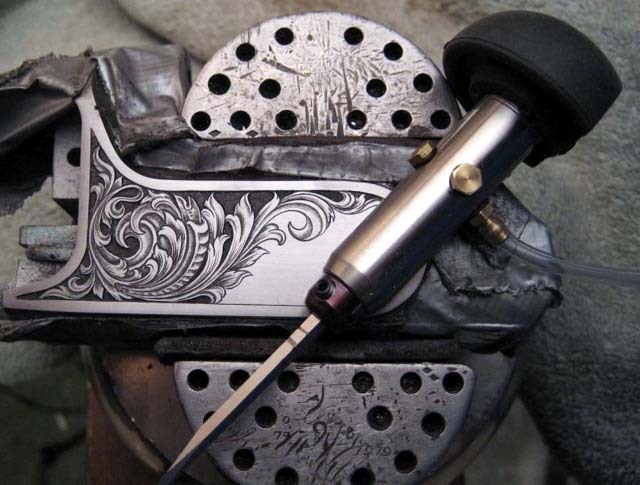 At Browning I have taught people to engrave that wanted to learn the art and absolutely fell in love with the Lindsay AirGraver®. 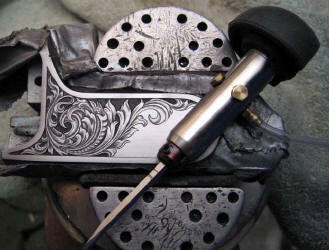 Also, I have let non-engravers play with it and guess what, they starting cutting with no problem.